This is the second review of a trilogy, read in entirely the wrong order (book 3, then 1 here, and 2 to follow), so should you be feeling confused, this book is a predecessor to Professor Stewart's Casebook of Mathematical Mysteries. 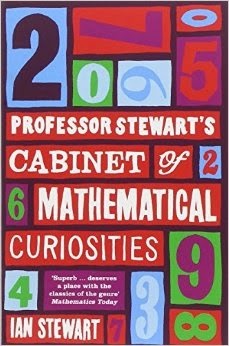 The format is very similar - a collection of factoids, logical puzzles, mathematical expositions and more to entertain any recreational maths enthusiast. I think it works significantly better in this first book of the series because, to be honest, by volume 3 there is probably a bit of barrel scraping going on. Here the topics are fresh and fun. Funnily, what works least well are the bits that are most like a conventional popular maths book, that describe famous mathematical problems and their context, such as the four colour problem and Fermat's last theorem. The entries for these are rather longer than the rest, but obviously much shorter than, say, Simon Singh's brilliant book on Fermat. That means that you get concentrated fact, but none of the interesting detail that makes a popular science or maths book appealing. For me these sections just don't work and I largely skipped them. But - and that's the joy of the format - it really doesn't matter. Because in a few pages there will be something else, and something else, and something else again to entertain and tickle the brain cells. It's notable that I got not just one (about a strange set of dice) but two blog posts (the other being about an oddity in my review copy) out of this book - because it made me think, reminded me of some old favourite problems and puzzles, introduced plenty of new ones and entertained. What more can you ask from maths.